Bryozoa - "Cryptosula Pallasiana" ? One of a number of very similar Bryozoa. 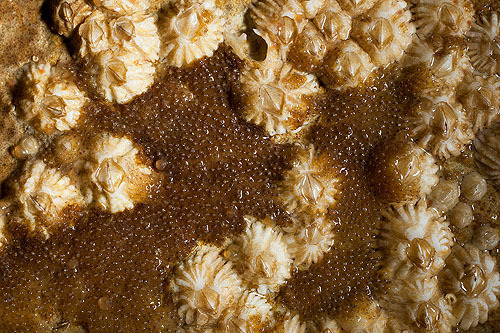 An encrusting Sea Mat , on a cave wall surrounded by the Barnacle - "Eliminus Modestus"
Often looking more like algae , it is in fact a colony of animals (Zooids) , each inside a secreted case - "Zooecium".